The best price we’ve seen all season! 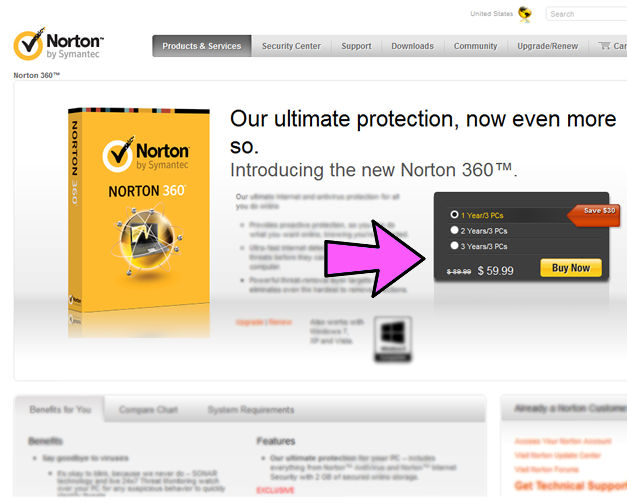 It’s no wonder why Amazon is Norton’s top selling retailer – They have by far the best deals on Norton 360. From a list price of $89.99, it’s on sale today for just $29.99. This includes for both the download version (letting you install it upon checkout) and the regular boxed version with CD inside (which qualifies for free shipping as long as you go over the $35.00 minimum threshold). Total savings come out to be $60.00 (67% off the standard list price). Prices can vary and this deal can expire without notice. Sale prices will vary so see Amazon.com for details. 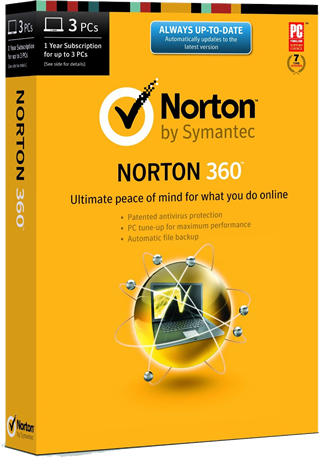 We just came across this exclusive promotion coming from the folks at Norton; save $40.00 instantly on the 2014 version of Norton 360 or just about any other product sold at the official Norton Store when you use code “N360US40OFF” at checkout. Best of all, it’s on top of the existing $30.00 sale they have going on and works on all single and multiple license purchases. So if you’re just interested in purchasing an annual subscription membership for protection on up to three computers, then your cost with this coupon code applied is $44.99 vs. the $89.99 retail price for a total savings of $45.00. Code expires on April 15, 2019. If you’ve been using Norton 360 for awhile now and your membership is coming close to the end, then you may be able to get special upgrade and renewal pricing available for existing Norton clients. For the annual plan, get $30.00 off automatically. For the biannual plan, get $40.00 off automatically. But wait, there’s more! Use promo code “USNORTON15” at the time of ordering at the Norton Store save an addition 15% off your entire purchase, regardless of the number of licenses that you are renewing. An keep in mind that upgrading the software may not be necessary. Just find the “Renew” link in your current Norton 360 software and enter the new activation key into the “I have a key or code to enter” section to renew your subscription. Open to existing Norton customers. Are you a student? Is a member of your household one? Then be sure to see the deals also available for students currently enrolled in classes as well as current educators in accredited educational institutions. At the Norton Store, all three of the most popular antivirus and computer protection programs are listed at 50% off. Now, extra coupons on top of the student price are usually unavailable but you may want to try the ones listed above to see if you’re lucky. Verification is needed before you complete your order so be prepared to provide your school information and a copy of your school identification card. Learn more about all of the other available student discounts on software that can save you upwards of 80% off the retail price. Open to verifiable students and teachers. Have you been using another antivirus software program like Mcafee or ESET and are looking to possibly try something new? Then you can download any of the latest 2014 software programs from Norton and try it out risk-free. You’ll have 30 days to try the new features, run some scans and clean up your PC or Mac before it will ask you to enter a license to fully activate it. At that point, you can either buy a license using one of our discount codes or just uninstall it and go with another competing brand. If by chance you end up buying the annual license and are not satisfied, then you can also request for a full refund. Learn more about the refund policy offered by the top software retailers. 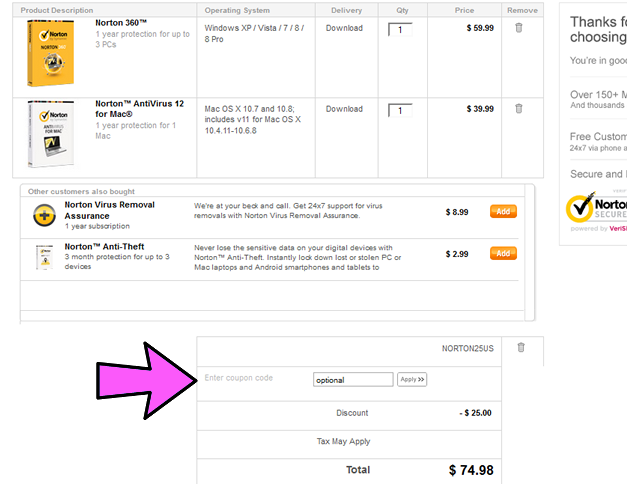 How do I use a Norton 360 coupon? You’ll notice that some of the offers here on Software Voucher will require a code to be entered at checkout while others will not (that’s because it’s probably already on sale or the discount is automatically applied to your order when you order from the vendors deal page). If you need to use a code to get the posted savings, then just follow the below steps if you’ve never done this before. 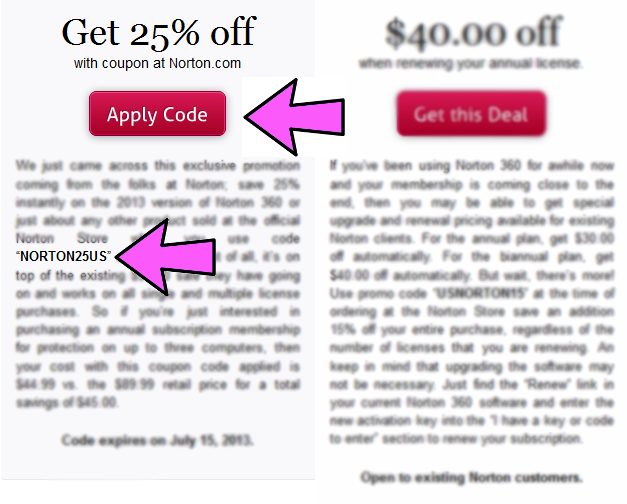 Step 1: Select the code that you would like to use on Norton 360. For this example we will be using “NORTON25US”. Be sure to copy it exactly how it appears, keeping all the capital letters intact, but without including the quotes. Step 2: Follow the “Apply Code” link. You will be taken to either the manufacture’s online store (if it’s an official promo code) or to the reseller (we only promote authorized resellers of Norton software so you can be rest assured that it’s a verified partner). Step 3: Once on the page, there will be “buy now” link on the right-hand side. 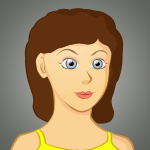 Just select the number of licenses that you need and the contract duration, and then continue. Step 4: On this summary page there will be a box to enter the code that you copied in Step 1. Be sure to enter it as it appears and then click the “apply” button. Step 5: You should see the extra savings applied to your order. Now you can go through the secure checkout to finalize your purchase. If something does not work, you can either try reentering the code or trying another Norton 360 code listed on this page. Not all coupons work for all product configurations so be sure to read the terms and conditions posted for any restrictions. Is a coupon or deal not working? Are you having difficultly with one of the Norton 360 deals listed here? Then please let us know what's the issue that you're seeing and we'll do our best to help you out. Although we check these promotions daily, it is possible that a deal just expired a little bit earlier than expected (a retailer may change a sale price without warning at anytime).